released. 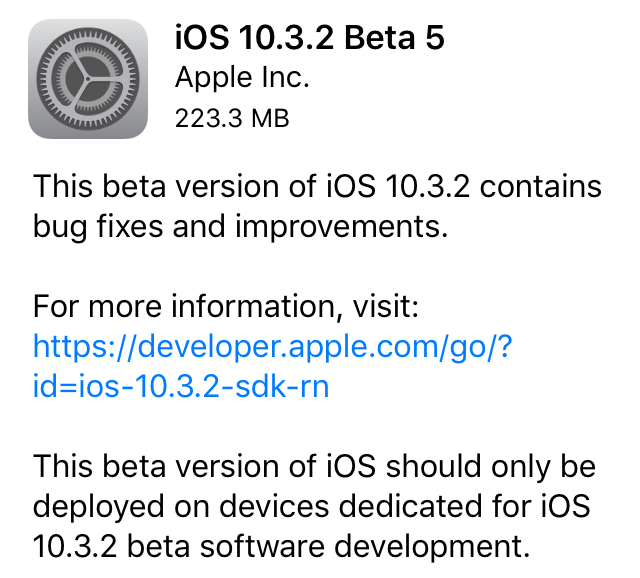 This fifth beta version of iOS 10.3.2 contains bug fixes and improvements. We will let you soon if any features is spotted on iOS 10.3.2 beta 5.
iOS 10.3.2 Beta 5 is available for download to registered developer’s via OTA over-the-air mechanism on iPhone 7- 7 Plus and other compatible devices like iPhone 6s-Plus, iPhone 6 – Plus-,iPhone 5S-SE from iOS settings app running previous beta or you can download iOS 10.3.2 Beta 5 through Apple’s online developer center and Apple Beta Software Program. So stay with us for more updates and don’t forget to follow iMangoss on Social Networks like Facebook, Twitter, Google+, or RSS for more updates if you haven’t already.